Cutting across traditional subject boundaries, Principles of Ecotoxicology, Fourth Edition gives readers an integrated view of ecotoxicology, from molecules to ecosystems. This new edition of a bestselling textbook continues to emphasize principles rather than practice, providing the interdisciplinary perspective and grounding required for research. Organized into three sections, the book first describes the molecular structures, properties, and environmental fate of pollutants. It then deals with the effects of pollutants on living organisms at the molecular, cellular, and individual levels. Moving into population biology and population genetics, the third part of the book addresses a question of great interest to ecologists: What effects do pollutants have at the levels of population, community, and the whole ecosystem? The book also looks at how ecotoxicology is used in the biomonitoring of environmental pollution, the investigation of pollution problems, the conducting of field trials, the study of the development of resistance, and the growing area of environmental risk assessments. Throughout, examples and case studies illustrate the principles. This updated fourth edition includes new material on nanoparticle pollution, bioaccumulation, biomarkers, and chemical warfare in nature, as well as a new chapter on the future directions of ecotoxicology. 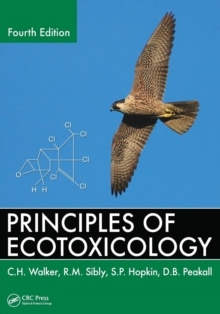 A concise textbook that will also appeal to practicing ecotoxicologists, it provides a solid basis for understanding what happens to chemicals in the real world, where they go, how they ultimately degrade, and how they affect the individuals and populations that encounter them. What's New in This EditionRevised and updated material throughoutA chapter on future directions of ecotoxicologyNew material on nanoparticle pollution and chemical warfare in natureExpanded coverage of bioaccumulation, biomarkers, and risk assessment for affected populationsMore case studies, many from the United StatesDiscussion of neurotoxic and behavioral effects of pollutantsRecent research on the decline of vultures and effects of neonicotinoids on beesOrganic Pollutants: An Ecotoxicological Perspective, Second Edition (CRC Press, 2008), a companion volume to this book, covers the mechanistic aspects of ecotoxicology in more depth.